No, by “elearning terminology” I don’t mean the glossary that may appear at the end of some online courses. Elearning terminology is about the language that is used within learning solutions, and also across, if as most elearning designers, you manage more than one project for the same customer. Elearning terminology is the common vocabulary you use to describe things and actions in your elearning solution. Click, create, canvas, adhesive, versioning software. Any “thing” or “action” that is relevant to the learning task you are supporting becomes a term. 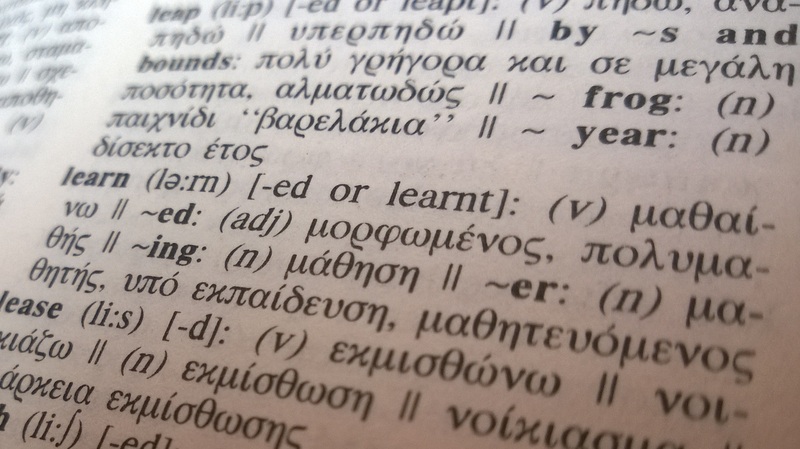 Why is elearning terminology important? Here are three important reasons to consider a good terminology strategy. Learning effectiveness. Your elearning solution is a small piece in a bigger puzzle, where tools, processes and things already have their names. It is imperative that in order to provide the most effective learning solution, your elearning uses exactly the same words (terminology) that are used in the workplace. The effectiveness of your solution also depends on how seamlessly it integrates with other existing materials such as manuals, workplace signs, compliance standards documentation, manufacturer datasheets, etc. Usability. Learners must deal with many platforms, software and devices during their day. Make their lives (and their learning) easier by creating usable elearning solutions that use exactly the same terminology they are used to see and read elsewhere. You may think it’s not that important whether we click, push, touch or press a screen button, but in fact the choice of terms have potentially huge consequences in elearning usability. Make sure you choose the right term and then stick to it throughout your solution. Translation. If you ever think about translating your elearning solution, then having a solid terminology base and having elearning solutions that strictly adhere to that terminology will go a long way in ensuring that you minimize the cost of translating your elearning solution. The inconsistent use of names and verbs in an elearning solution make it incredibly hard to translate while keeping a minimum level of effectiveness and usability. Well managed terminology means cheaper translations. Create a simple glossary that contains key names and verbs used in your elearning solution. This will depend on the subject matter, but also on the industry, the hardware and software platform used, as well as any existing documentation already in use in the workplace. For each entry, enter a brief description of when to use it, and also any other terms that you should avoid in favor of the chosen term. For example, if you decided that on-screen buttons on your platform are “clicked”, then also add a note saying that the verb “push” is not acceptable, but has to be replaced by “click” instead. Before each major milestone involving text (audio scripts going to recording, text going to prototype, etc.) make sure you perform a search (& replace, where appropriate) to wipe out any non-compliant terms. Of course there are many advanced tools for managing terminology more efficiently, but for small projects or where you are not likely to handle more than 100 terms, then these simple steps will ensure your elearning terminology management improves learning effectiveness, usability and any potential translation work. You will also have another strong argument to be involved in the next elearning project for this customer: you already know the terminology well and have the documentation to prove it; it will be easier for you than for competitors to apply it consistently in future learning solutions.